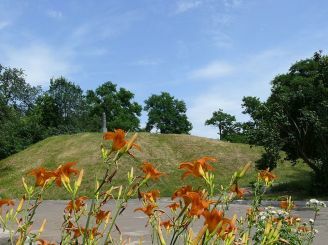 Kurgan "Black Grave" in Chernihiv is one of the most mysterious mounds in the region. 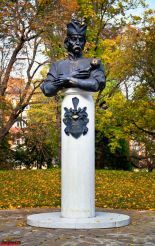 "Black Grave" in 1870 investigated Chernihiv archaeologist Dmitry Samokvasov. Barrow height reaches 10 meters in circumference - 125 meters. In ancient times it was surrounded by a deep moat. Kurgan "Black Grave" zaduyetsya first time in the annals in 1147. During excavations revealed that the mound of buried three people cremated. Presumably, this was a man, a woman (wife or slave) and youth (close relative). 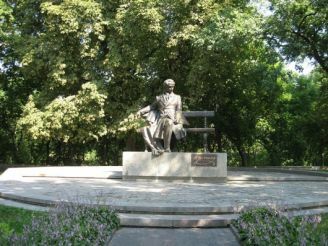 Every resident of Chernigov known legend, though the Black Grave ashes founder of the Black Prince. Both Riton that were found in the mound on okuttya bears many images of people and animals. Soviet scientist Boris Rybakov linked these pictures of the epic hero of John Hodynovycha. In the warrior bride Nastia was what lured Koschey Immortal, promising wealth. But flown prophetic crows, who prophesied victory Hodynovycha. Angry Koschey potsilyv arrows at a crow. Not hitting and feathers, arrows and hit back at Koshchei Immortal. The fact is that during the excavation of the mound found a bronze figure Norse god, probably Torah. We can assume that the mound was buried Prince, which in ancient times was also a priest. There is a version of "Scandinavian reading." In the foreground image of the wolf, which is one of the main characters in Norse mythology. In rhymed collection of Scandinavian myths "Elder Edda" is a reminder of Fenrir, the wolf, who was considered the worst enemy of the gods. Images next singing rooster as described in Norse mythology. It starts with the description crow death gods. Found in a mound Byzantine Coins 945-959 years indicate that the mound was poured in the second half of the 10th century. So this may not be dumping the Black Prince. 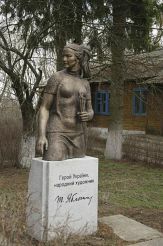 The town was founded much earlier in the 10th century and has been the center of Chernigov-Seversk land. Kurgan "Black Grave" is the only princely burial in Eastern Europe, which survived to the present day. During excavations revealed the following findings: 2 helmets, 2 swords, 2 armor, arrowheads, stirrup, fragments of boards. One of the most important discoveries - the horns round. Among them were doing ritual vessels which called Riton. Women`s jewelry to include temporal rings, gold and silver bullion from melted in the fire ritual ornaments, ivory comb. At the feet of a woman found 10 sickles. At the headboard buried yet found fragments of a dozen buckets. Most likely, they were filled with wine, honey and beer. Kurgan "Black Grave" is the Black Prince Street near the intersection with streets quiet and thieves (renamed the bakery) are .Poryad Eletskii monastery and park "Chernihiv citadel" .